Yesterday the EU released “Guidance and policy recommendations for the collaborative economy” with a press conference featuring no less than Jyrki Katainen, European Commission Vice-President for Jobs, Growth, Investment and Competitiveness. Official documents are available here. I’m working on a longer analysis piece that will put this guidelines in relation to what’s happening in Europe — at least from my point of view and privileged position in the Ecosystem as OuiShare Connector and Program Co-Chair or OuiShare Fest — but I’ll share here some highlights for those who might have no time to read the documents and watch the half an hour long conference. In general, this guidelines show a strongly market oriented approach, which essentially looks at regulations as ways to improve market performances, make the European Digital Single Market an environment capable of attracting and incubating new digital businesses and let them possibly grow. According to Jyrki Katainen, there’s now a global competition for regulations (translation: for the most laissez-faire) and Europe “can’t have fragmented regulations”. He said that European DSM is essential for startups to scale up and avoid that “these businesses will grow somewhere else”. Adopting a widely discussed lexicon he said that “Europe’s next Unicorn should stem from the collaborative economy”. 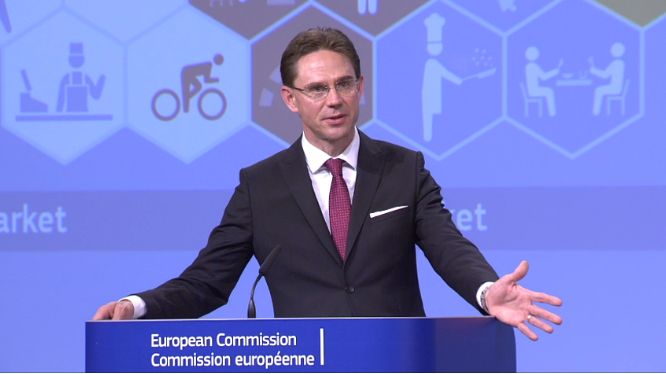 Katainen stressed the point that “we can’t send businesses away because we protect existing business models” and several time put the old and new business models on the same plate: clear message EU won’t protect existing models just for the sake of saving jobs (eg: Taxi and Hotel business models). Overall it seemed a presentation really in line with the heritage of Neelie Kroes that, as some of you may know, it’s now Uber policy advisor. 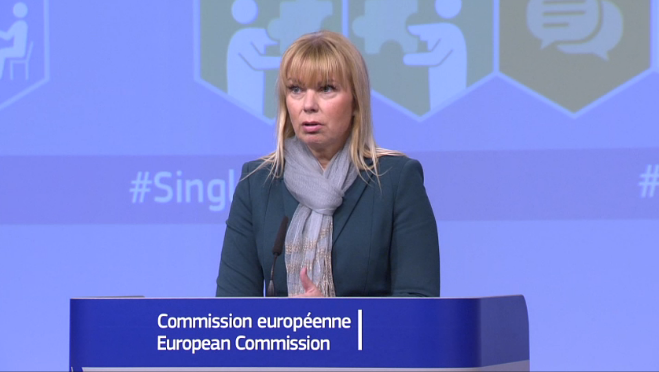 In the following minutes Elżbieta Bieńkowska, the Commissioner for Internal Market, Industry, Entrepreneurship and SMEs that apparently lead the working group, reinforced the message with a few statements. She highlighted how two elements would undermine EU growth (still firmly the North Star) in the Collaborative Economy: uncertainty of the rules and a the emergence of regulatory fragmentation (at national, local and regional level). She also told the audience that a primary objective of the guidelines is to help understand when a platform is a service provider and when it’s just an intermediary (“Q: is Uber a transport company?”) and to clarify whether a person is an independent professional or employee (“Q: should Uber Drivers be considered employees?”). Finally, Bieńkowska confirmed that EU will enforce the application of EU laws in the member states on this matter. 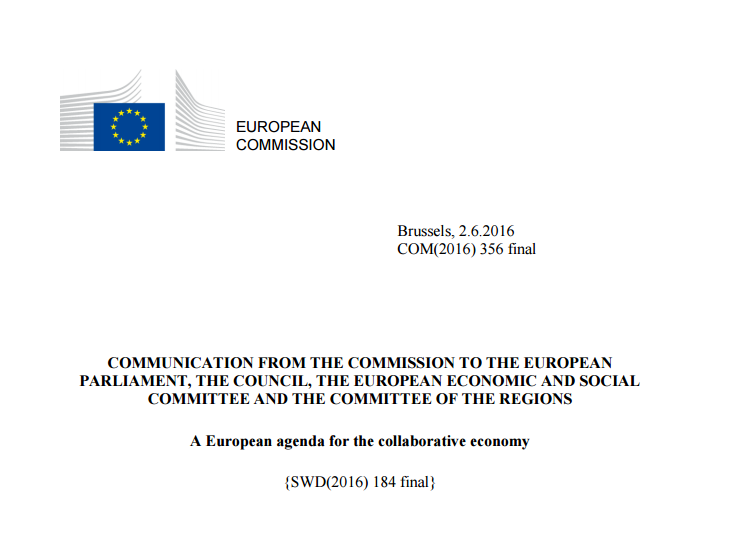 A first important consideration to make is that most of the Guideline document works on characterizing the Collaborative Economy platforms most likely as intermediaries or, like EU bureaucracy calls them, digital Information Society Services. These entities are generally lighter regulated than traditional Service Providers (eg: the difference in regulation due to being considered a Taxi hailing app vs being considered a Transport Provider is huge). The framing on understanding who’s a professional vs who’s only an occasional peer to peer provider is still very confused: there’s also the acknowledgment that member state are regulating this aspect non consistently. Also platforms need to make possible for the consumer to distinguish and clarify whether or not the other entity is a professional trader or not. As an example, an Airbnb Superhost that is renting his second home all the time would definitely qualify as a trader (since all 3 aspects are present) and may soon need to have an official permit, a safety equipped house, register documents of guest and her profile should soon be labeled on the platform as such (professional). On the other hand, a Blablacar driver is not going to be considered a trader (only having number 1 possibly). In a few words as platforms help a person to “professionalize” (a trait that is peculiar of successful platforms) she should need to comply with existing regulations for professional traders at some point. if there’s a real remuneration (not merely a compensation of costs incurred) and the activity is of economic value that is effective and genuine “excluding services on such a small scale as to be regarded as purely marginal and accessory”. The document generally explains that the collaborative economy taxation schemes should comply with existing taxation schemes. The document praises the approach of estonian government that receives data from the platforms and use it to pre-compile tax declarations. Unnecessary burdens placed on economic player are pointed out as dangerous: for example, the new italian Sharing Economy Act which implies a strong integration between platforms and governmental systems for tax collection and even makes platforms tax withholding entities, may be seen as an unnecessary burden for new platforms entering the market. Data exchanges are definitely more encouraged. Also, essentially, platforms are seen as not responsible for illicit activities carried on the platform itself and don’t need to actively seek for illegal behaviour. They remain liable for the ancillary services they provide directly (for example they would be liable for a security breach in a payment system). Every effort in grounding regulations in data is to be appreciated and welcome. It will be interesting to see how this EU guideline plays out in the wild of European Member State regulations. At a first sight, it seems that Italian Sharing Economy Act (which is by far the most advanced national collaborative economy regulatory framework in Europe) is fairly overlapped with the EU suggestions — sharing at least the permissive approach — but is still way too bureaucratic and should be likely simplified. In general the EU guideline looks conflicting with the bulk of the regulations and visions spurred in the last few months in Europe, mostly to protect local communities and existing stakeholders from the disruption of the platform’s age. Stay tuned for deeper thoughts. Learning how Platforms, Peers and Partners work together. Creator of Platform Design Toolkit: http://www.platformdesigntoolkit.com.